UPDATE: Samsung Galaxy Nexus is first with Android 4.0, on sale November 17 | What Hi-Fi? Samsung has confirmed that its eagerly-awaited Galaxy Nexus smartphone will go on sale this week, from November 17th. It's now available for pre-order on the Three mobile network. The Galaxy Nexus is the first handsset available with Android 4.0 Ice Cream sandwich. The operating system will roll out to other handsets – including the entire Galaxy range – in the New Year. Full details in our original story below. 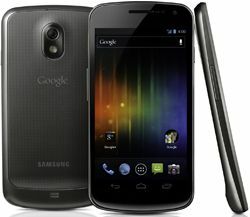 Samsung and Android have announced the most advanced Android smartphone yet, the Galaxy Nexus. The Galaxy Nexus was launched in conjunction with Android 4.0, aka Ice Cream Sandwich, the latest version of Google's Android operating system, and is the first mobile phone to use the OS. Samsung's latest handset shares many features with the company's Galaxy S II. It has the same speed dual-core 1.2GHz processor and also comes with 1GB of system memory. The Super AMOLED screen is bigger, at 4.65in, and boasts a superior 720p resolution screen. There are two cameras, with the 5MP camera capable of shooting 1080p video. Sporting Bluetooth and WiFi and available in 16GB and 32GB incarnations, the Samsung Galaxy Nexus is due out in November. You may notice the lack of any buttons on the Galaxy Nexus – this is part of the new Android 4.0 update, which prefers touchscreen icons to physical buttons. Android 4.0 unifies Android mobiles and tablets around the same interface. It's a new platform, with fresh gesture controls and updates to the voice and keyboard controls. You can use folders to store your apps and easily upload content to Google's cloud, too. Staples such as mail, calendar and browser have been updated, too, in order to make the most of the native 1280 x 720 resolution that will become standard across Ice Cream Sandwich smartphones. Elsewhere the ICS camera has been updated with a host of snazzy features including panorama images and timeshft films, contacts are renamed as 'people' bringing together information from social media networks, while the integrated NFC chipset allows you to exchange files by simply bumping two phones together. Other existing handsets from HTC, Motorola and Samsung are expected to get the Android 4.0 update very soon, while new handsets should also roll-out later this year and in to 2012.